One of the programs of the not-for-profit agency Harlem Children’s Zone, Inc., the Harlem Children’s Zone Project was launched in 1997, focusing a comprehensive array of social-service and education programs in a 60-block area of Central Harlem. Created through a series of discussions with residents of Harlem, the Zone Project aims to help children and families climb out of poverty and become satisfied, productive members of the community. Community Pride – This program organizes tenants building-by-building, block-by-block. The program organizes and revitalizes building and block associations, as well as helping tenants to become owners of city-owned buildings. The Baby College – The focus of this program is a nine-week series of classes on raising children from birth to age three. Designed with the help of renowned pediatrician and author Dr. T. Berry Brazelton, The Baby College offers its workshops on Saturday mornings with child-care available. Employment and Technology Center – ETC helps High School students finish HS and go on to college. The Center offers classes in computer skills. The Center also offers students assistance with basic skills, work readiness, college preparation, job training and internships. 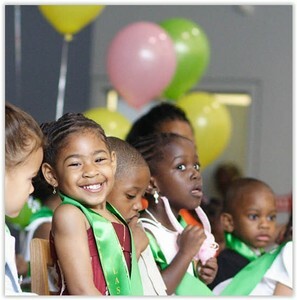 Harlem Gems – This pre-kindergarten program helps children ready themselves to enter kindergarten. Classes have a 4:1 child-to-adult ratio and run from 8:30 am to 5 pm. Harlem Peacemakers – This program, funded in part by AmeriCorps, trains young people who are committed to making their neighborhoods safe places for children and families. Single Stop – Held at several locations within the Zone, this free service offers benefits screening and assistance, referrals for family counseling, financial advice and legal consultations. TRUCE (The Renaissance University for Community Education) – This youth development through the media arts program is aimed at adolescents ages 12-19. It fosters academic growth and career readiness. TRUCE Fitness and Nutrition Center – This program offers free classes in karate, fitness and dance, as well as providing access to fitness equipment. The Asthma Initiative – Working with Harlem Hospital and Columbia University, HCZ has done outreach to the community and found that Central Harlem has an asthma rate of 30 percent among children, 12 and under — many times the national average. The Initiative works with children and families so they can manage the disease and lessen emergency room visits and school absenteeism.